This 31' 1967 Classic ChrisCraft Commander named A Vita Luna ( Latin for " A Crazy Life ! " ) is "styled in fiberglass" and legendary in the fiberglass boat industry. Avitaluna is also one of a hand full of rare soft top C.C. On the water Avitaluna is powered by twin inboard 327 F15 210 HP gasoline engines that have been upgraded with electronic distributors Petronix flame thrower coils and all new heavy duty spring reinforced double clamped hoses, new FW Impellers and plug wires. The engine hours are original and low for the age of the boat and the engines purr like kittens, run strong have a long life ahead of them and sound classic. When cruising there is not another boat Antique wood,Classic,or New that does not wave or give a "thumbs up" as they pass by. 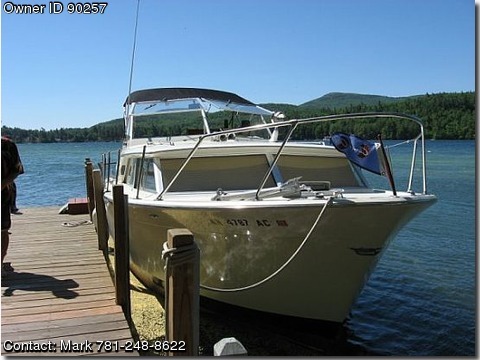 Avitaluna was purchased new on Lake Winnipesauke New Hampshire in 1967 and has had a seasonal fresh water life. I am the third (3rd) owner in 45 years . After purchasing the Commander I had the beautiful Mahogany Deck Rail's, Helm and interior cabin professionally restored to show quality. I also added custom tile flooring to the galley deck and the head. At the time of restoration I upgraded the fresh water system to all new tank, pump hoses, faucets, toilet and added a shower system at the transom. The galley has a sink with running water, a two burner stove and origional Mahogany ice box. The interior cabin windows were custom appointed with dark bamboo type shades. The upholstery was recovered with high quality fabric and I had a custom Mahogany table built for the galley. The cabin space has a classy yacht atmosphere. Also during the restoration my intentions were to have Avitaluna completely self sufficient electrically while hanging on a mooring without the use of gas generators or AC power .I added a deep cell battery system and rewired Avitaluna so that the engine (starting ) batteries after charging would close from house use when the boat was not running and the 12volt DC system could then be used without fear of killing starting batteries to run interior lighting, Radio,Color T.V /DVD, 12 volt coffee maker, charging of cell phones etc. Of course the boat could easily be converted to AC for Marina live aboard . I added to the transom a zero maintenance swim platform and ladder system. I also added a fish /depth finder new Ship to Shore Radio with remote speakers and a second hand held mic. at the Helm for emergencies . . .
At the Helm the comfortable seating has been professionally reupholstered. Original chrome Morse controls for each engine and original chrome instrument panel with new digitally controlled trim tab system . Avitaluna is a nice easy to use and maintain cabin cruiser. She is perfect for comfortably cruising a lake or dropping anchor for a swim or over nighters. Avitaluna sleeps up to 6 people in the cabin with a forward berth for 2 and the sofa converts to a double bunk for 2. The galley's sofa/chairs slide down to create another bed for 2. In 2010 I had the boat surveyed under SURVEYOR's NOTES the Surveyor states ...."Overall this vessels in Exceptional condition. " This vessel reflects responsible upkeep and prideful ownership .